FC Barcelona has been drawn with Osasuna for the next round of Cop del Rey clash. The draw took place today morning and had thrown up some interesting posibilities for next round. Guardiola wouldn't be happy with the dates for the Last 16 round. The frist leg will take place at Camp Nou between jan 3 to Jan 5. That could see the South american contigent being used in limited capacity as they would be just back from holidays. Having the second leg away from home means that Barca has to take a definie advantage in the first leg and that too with our problem usually after the breaks. The talk of the town is not the clash with osasuna, it's the supposed Quarter Final Clash with Real Madrid. 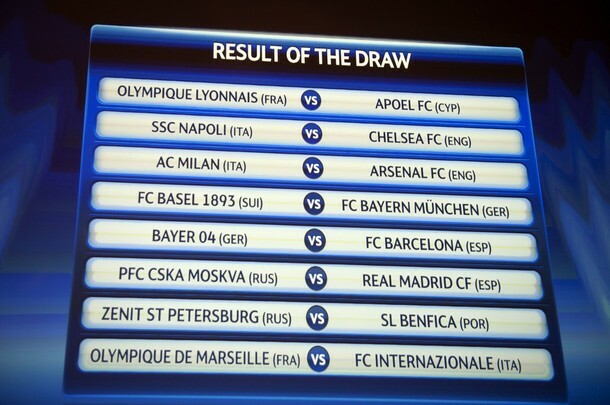 Madrid has been drawn with rich boys Malaga for the round of 16. If both Barca and Madrid win, then the first leg of Quarter Final will take place at Bernebeu on January 18th. Isn't Laureus Awards Unfair to Team Sports? 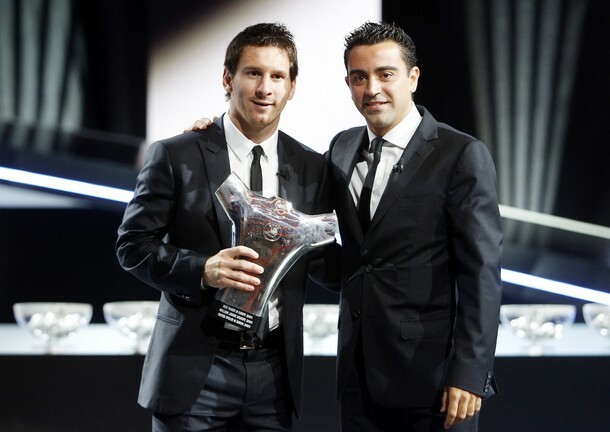 Lionel Messi, once again has been nominated for the Laureus World Sportsman of the Year award. He was nominated in three occasions and have not yet been succesful in winning this one. FC Barcelona also has been nominated in the Sport Team of the Year category and Abidal also for the Comeback of the Year. 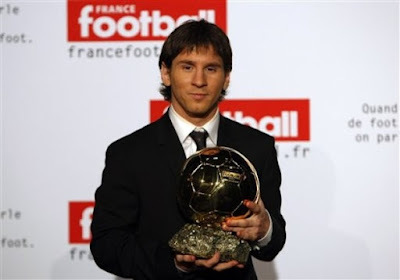 Messi has been nominated along with the likes of Djokovic, Vettel, Bolt and Nowitzki. 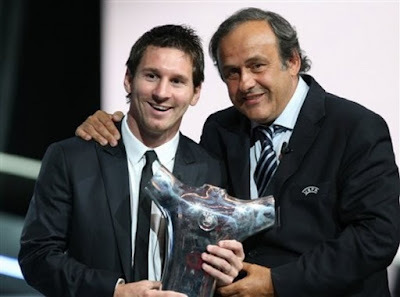 And the company of these great Gentlemen are the problem for the Barca genius. It's not that these are players who make Messi feel miniature in status. The problem precisely is that three of them - Djokovi, Bolt and Vettel are players who plays in a Individual sport. 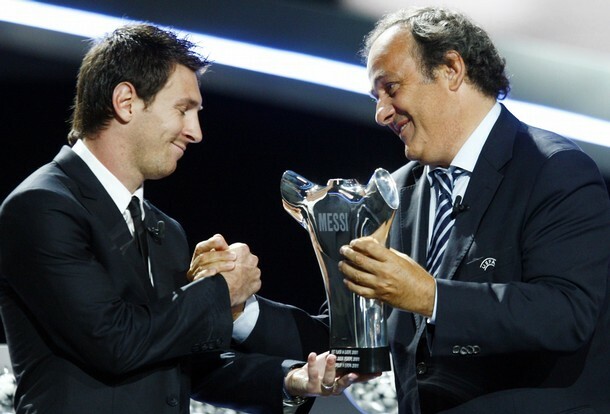 So at the time of voting, the fact that messi plays a Team Sport will act against him. You cannot blame the Jury members for making such a choice. If you are given thge choice of picking between Messi and Djokovic, you will probably end up picking the Serbian because he fights alon and Messi fight along with his team. Eventhough Messi have achieved almost everything compared to Djokovic's achievement - scored 53 goals, Won numerous titles, scored and assisted in every competition in this calendar year, but still a counter argument could be placed "That he could not have done it without his teammates". 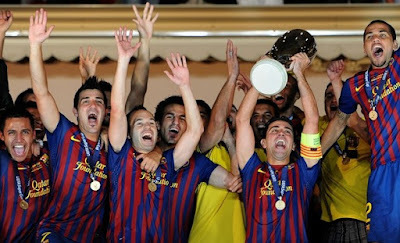 FC Barcelona were crowned the 2011 World Club Champions following a brilliant 4-0 victory against South American Champions Santos. 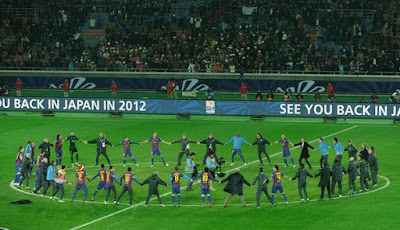 The battle between the Champiosn of Europe and Champiosn of South America were a mismatch with Barca controlling the proceedings for the majority of match. First half goals from Messi, Xavi and Fabregas put Santos out of the final, Messi completed the tally with another goal in the second half. This is Guardiola's 13th cup victory as the FC Barcelona first team manager, all coming in four seasons. 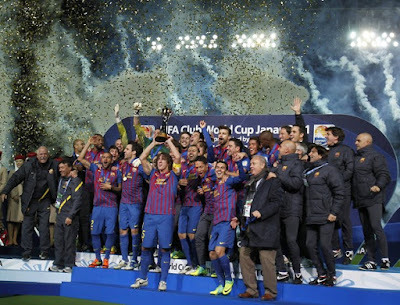 Barcelona have now won three titles this season - UEFA Super Cup, La Liga Super Cup and World Club Championship. With Villa out with injury and Sanchez also unavailable due to a knock, Guardiola went in for a revamped formation. The defense had Alves, Pique, Puyol and Abidal. The midfield had Iniesta, Xavi and Busquets. Thiago, Cesc and Messi made the attacking trio. The presence of 5 midfielders made it very clear that the formation of choice was the 3-4-3. FC Barcelona has been drawn against Bayer Leverkusen for the first knock out round of this season Champions League season. Barca fans could be very pleased having avoided a trip to east or to the other tough opponents. The first leg matches will be played on th 14th, 15th, 21st and 22nd of February. Real Madrid meanwhile will be visiting Russia for the first leg after getting CSKA Moskva as their opponents. The pick of the draw was the double Anglo-Italian clash with Milan drawing Arsenal and Chelsea drawing Napoli. Our opponent Bayer Leverkusen is nowhere near the heights they saw in the 2001-02 season when they reached the final. But finishing runners-up last season ahead of Beyern Munich is no small achievement. I would say it's a good omen drawing a German opponent. Last season we played the first leg of Round of 16 in England(where the finals were held) against Arsenal, this season the final is held in Germany. FC Barcelona booked a place in the final of this year's World Club Championship final against Santos courtesy of an easy 4-0 drubbing of Qatari Club Al Sadd. 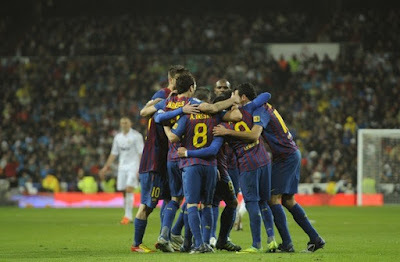 It was a mismatch from the beginning and the only question was by what margin FC Barcelona will emerge victorious. 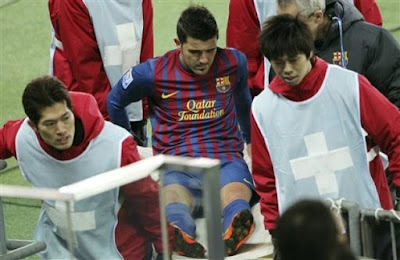 But the match didn't end up so well for us, with David Villa being substituted midway due to injury. The club has confirmed that the player has suffered a fracture to tibia in the left leg. That could see him out for almost 12 weeks. Coming back to the match Adriano scored twice in the first half and Keita and Maxwell scored in the second half to complete the tally. The final will be held on Sunday. There is no doubt that every Barcelona and Real Madrid fan is still reeling under the effect of the brilliant El Cklasico night at the Bernebeu on Saturday. Can't blame anyone as it usually takes more than a day atleast to get over these. The reactions from both Camp to the result was very much interesting. Barcelona fans felt they were vindicated, whereas the Real Madrid ones were shattered to pieces. A stroll into any of Real Madrid blog and you were able to sense the extend of dissappointment. Cristiano Ronaldo getting the stick for the poor performance was normal, that usually happens when someone happened to spend 94 Million Euros on a player. But Iker Casillas getting the stick was quite shocking, especially counting the number of saves he pulled even in this match. Real Madrid fans were calling for both of them to be benched for the next Clasico. That was seriously hillarious. Meanwhile Mourinho who for once appeared to be a bit graceful in defeat, never forget to take a swipe on the GOD. Now it looks after UEFA, UNICEF, Referee etc it's the Almighty himself who has aligned with us. As the saying goes "Fortune favours the Brave", that also happened in the match. Xavi was brave enough to take the shot, just like Real madrid frontline was brave enough to press Valdes and forcing the mistake for their goal. 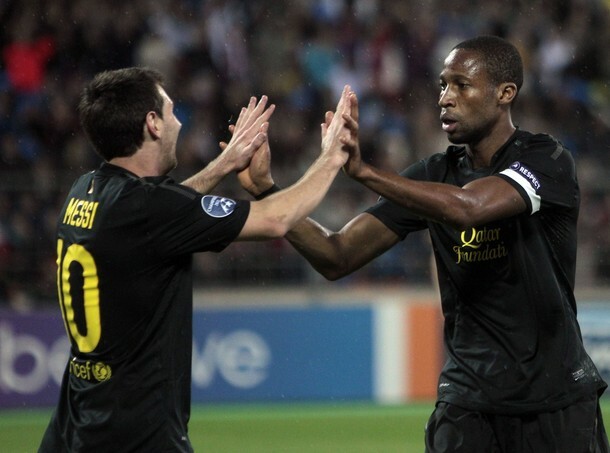 FC Barcelona got the league back on track with a thrilling 1-3 comeback win at Santiago Bernebeu. The match started with a disaster as far as Barca were concerened. We went a goal down in the very first minute following a horrendous mistake by Valdes. But this match was about whether Barca's grit and they dig deep and produced a brilliant comeback. Sanchez equalised in the 30th minute and Xavi and Fabregas scored in the second half to conquer the stadium of Santiago Bernebeu. This is Real Madrid's first defeat at home and also this looks like their first defeat after going 1-0 up. This clash had a huge importance as it set the phsycology for the rest of the clashes this season. Many of the pundits would like this victory. Many were arguing that Mourinho's second season is really when he push things up opponent's throat. But this one didn't go according to the script for him. One of the most disappointed football writer would be Sid Lowe from Guardian who predicted a Real Madrid win. He did last season also. So he is officially our lucky charm. Putting to rest all confusion regarding the formation and line-up, Guardiola decided to go with a 4-3-3 formation. David Villa was ommitted from the starting line-up again and Cesc took his position. We had Valdes on the goal; Alves, Pique, Puyol and Abidal formed the defender. The midfield had the Iniesta, Xavi and Busquets. The front trio had Cesc, Messi and Sanchez, with Cesc playing teh false 9 role. Meanwhile Real Madrid went with a 4-3-3 formation, with Casillas, Coentrao, Ramos, Pepe, Marcelo, Xabi Alonso, Diarra, Ozil, Maria, Benzema and Ronaldo. Less than 24 hours is left for the start of the first edition of this season's "El Clasico" encounter in the La Liga. Usually this would have been the first meeting between the two giants of not only Spanish football, but World Football. But this year they have already met twice in the two legged Super Copa clash and Barca had emerged deserving winners at the time. Since Guardiola took over as manager, the first Clasico has always been played at Camp Nou. That gave Barca the edge to get to the front foot early on. This time FC Barcelona will be visiting Santiago Bernebeu for the first edition. The last time this has happened was in the 2006-07 season, when Barca went down 2-0 and eventually lost the League. But don't worry a year ago Ronaldinho inspired Barcelona mesmerised the Bernebeu crowd with a 3-0 victory and eventually won the League and the Champiosn league. This is Guardiola's third fourth visit to Santiago Bernebeu as a coach and he hasn't tasted defeat in any of those visits. Of all the visits this one could be extra tricky with Real Madrid leading us by three points with a game in hand. So this eventually become a must win match for FC Barcelona. From a fans perspective, Barca fans are a bit confused about how we will approach this clash. There is no doubt that we will be going for the kill, but the confusion is about the formation and the line-up. I will come to that a bit later. First we will start with our opponents. Video about Miguel Ruiz's, official Barca Photographer Book. Gives a bit of insight into Barca dressing room. The drooling faces after the Copa del Rey defeat made me emotional. With the completion of the last of Group matches yesterday, we now clearly know the clubs which will go to the next stage of 2011-2012 Champions League Tournament. Bayern Munich, Napoli, Inter Milan, CSKA Moscow, Benfica, FC Basel, Real Madrid, Lyon, Chelsea bayer Leverkusen, Arsenal, Marseille, Apoel Nicosia, Zenit St Petersburg, Barcelona and AC Milan are the ones qualified for the knock out stage of 2011-12 Champions League. Last night was quite disastrous for the two clubs from the city of Manchester. Despite winning 2-0 against Bayern Munich at home, the cash rich Manchester City found themselves going out of Champiosn league as Napoli won at Villareal. But the shocking result of the night was Manchester United going out losing to FC Basel. Italy with three teams lead the country wide representation in knock out stage. Spain, England, Germany, France and Russia all have two clubs representing them, Portugal, Switzerland and Cyprus has one each. The last time Manchester United got out in Group stage was in 2005-06 season, a season in which FC Barcelona triumphed in Europe. To make matters more interesting in the 2005-06 season, Manchester United got eliminated on the 7th of December. So are the stars are aligning perfectly for us? Let's hope. The final three men shortlist for FIFA Balon D'OR 2011 has been announced. The final list is no surprise to anyone following serious footballing action - Cristiano Ronaldo, Lionel Messi and Xavi Hernandez. Actually everyone know who is going to win - Lionel Messi. But still you need a three man shortlist. The Women final three contenders are Marta from Brazil, Homare SAWA from Japan and Abby WAMBACH from USA. Xavi and Messi are not the only ones representing Barca. They have their manager, Pep Guardiola giving them company. Guardiola has joined Mourinho and Ferguson for the final shortlist of Coach of the Year. Lionel Messi is also vying for FIFA Puskas Award for the best goal(Goal against Arsenal) along with Neymar and Wayne Rooney. FC Barcelona closed down the lead between them and Real Madrid to six points with a comfortable 5-0 victory against fourth placed Levante. Cesc Fabregas opened the scoring, then doubled it followed by Cuenca, Messi and Sanchez goals gave Barca a comfortable victory at Camp NOu. Now all the focus will shift to next week's Clasico action at Bernebeu. With the El Clasico next week, everyones eye was on the line-up Guardiola was going to employ tonight. Once again Pep Guardiola went with a three mand defense, which could again feature at Bernebeu. Abidal, Mascherano and Puyol made the back three. The midfield had Cesc, Busquets, Iniesta and Xavi. Cuenca, Messi and Sanchez formed the front line. Levante has been in fine form this season and is known to have a very well organised defense and that definitely was the reason why a 3-4-3 formation was employed. FC Barcelona secured the top spot of Group H in Champions League with a high tempo thrilling 3-2 victory against AC Milan. An own goal from Van Bommel, a penalty from Messi and another beautiful goal from xavi completed Barca's socreline, whereas Ibrahimovic and Boateng scored for AC Milan. In a match which put to practice the Galacticos principle (that is we will outscore you, no matter what), Barca emerged victorious. It was a tough place to test the three man defense but the team pulled out a brilliant win. Barca fans wanted to shore up the defense everytime we took the lead, as we were getting stretched in the defense. But guardiola was throwing attackers after attackers. He was proven right by him team. With this victory Barcelona has secured the top spot. That means we can relax for Bate Borisove visit to Camp Nou on Decen=mber 7th. That should give Guardiola enough chance to rest his major players ahead of the first Clasico on December 11th. 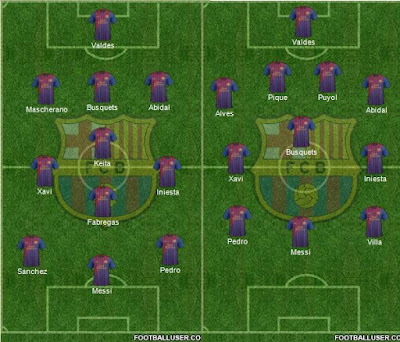 Guardiola lined up with Valdes, Puyol, Mascherano, BUsquets, Abidal, Keita, Xavi, Thiago, Fabregas, Messi and Villa. AC Milan mean while lined up in a normal 4-3-3 formation with, Abbiati, Zambrotta, Silva, Nesta, Abate, Van Bommel, Seedorf, Aquilani, Boateng, Ibrahimovic and Robinho. With both teams already qualified, tomorrow night's clash at San Siro between AC Milan and FC Barcelona is all about claiming the top spot in Group H. With 10 points Barca is at the top of the group ahead of AC Milan by two points. Usually two draws from now should see us stay at top, but the problem for Barca is the thei last Group match will take place days ahead of the first Clasico. Guardiola would want to give his boys some rest ahead of that Clasico, and hence the clash at San Siro becomes crucial. A win will secure our top place. He have to do without the service of Iniesta at San Siro, who has been ruled out due to a slight injury. That may not be a cause of hge concern for Guardiola, as he got Cesc Fabregas at his disposal. Our last visit to san Siro wasn't a pleasant one losing 3-1 to Inter Milan in the Champions League semi-final. Our recent away form in Champions league is not quite good, struggling to win against major team. So there are some issue Guardiola needs to tackle tomorrow. Meanwhile AC Milan who shocked us with a last minute draw at Camp Nou, will be vying for us at their own back yard. And they would have the service of Zlatan Ibrahimovic for tomorrow night's game. FC Barcelona made shot work of the visiting Zaragoza side with a brilliant 4-0 victory at the Camp Nou. With this win, Barca had briefly moved to the top of standing, equalising with Real Madrid, who will be playing Valencia shortly. In a night after the international break, Pique, Messi, Puyol, Villa all scored for Barca. Not only they managed to win the game comfortably, they ensured that the clean sheet at home this season has been stretched to yet another week. We haven't conceded at the Camp Nou in La Liga this season. It was a mismatch from the begining and had it not been the performance of their keeper, the deficit would have been much bigger for Zaragoza. With AC Milan on mind, Guardiola rested a number of players. The defense had Alves, Puyol, Pique and Maxwell. Xavi, Keita and Cesc made the midfield trio. Cuenca got yet another start at the top along with Messi and Sanchez. Ideally Messi would have been rested but with already trailing Real Madrid by three points, Guardiola needed Messi to start the match. David Villa vs Lionel Messi, What is actually going on? For the past two to three weeks, this story has been the most followed in footballing circle, especially related to La Liga. We heard about how Villa feels that he is being hard done by Messi, we also heard about Liverpool and Chelsea already waiting to land the unsettled Spanish national hero and the story goes on. For those who didn't hear about any of these, let me summarize the latest activity in the rumour field. Apparently two weeks before a Valencia based media house reported a story that David Villa and Lionel Messi does not see eye to eye. As expectedly the Madrid based media houses jumped on to story to add more tasty twists and the English based one contributed to the whole situation assuring that Liverpool and Chelsea are waiting in the wings to get the striker. The rumours did force Guardiola to personally assure the fans that there is no rift between Messi and Villa, his explanation was that no one can ever fall out with such a nice guy like Villa (pretty true). It was strange that these rumours suddenly appeared after some excerpts from Ibrahimovic's book were made public In those Ibra accused Messi of taking his favoured center forward position at Barca. Hence Barca fans rightly suspected it was yet another attempt by certain clubs to create tensions at Barca, remember the doping charge against Barca players. It took an injury time goal from Lionel Messi to salvage a point for Barca at San Mames. With this draw Barca found themselves trailing leaders Real Madrid by three points. This is the first time Guardiola's team is trailing their arch rivals by more than two points. This result has put the emphasis in the league back to Real madrid as they could aproach the home match against us on December 10 with a bit of ease. For us that tie has already become a must win match, until and unless Real drops point in the build up to the Clasico. Even though in the final analysis we have dropped two vital points, a draw at San Mames is not a bad thing for the team. Especially considering the conditions out there. Many places in the field resembled a swimming pool and that completely negated our tiki-taka style of play. Especially in the second half the Bilbao box was clearly full of water and that at times prevented our midfield maestros from attampting through balls which woul have split the defense. Even Messi and Iniesta found it difficult to dribble and continue on their mesmirising runs. 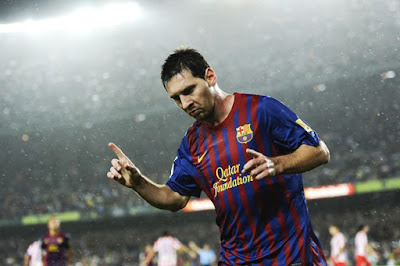 FC Barcelona went back to the top of La Liga with a 3-0 victory at home against Racing Santander. 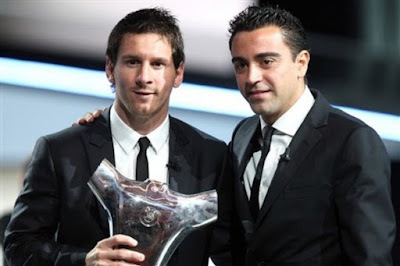 Lionel Messi scored twice on the night and Xavi scored once to give Barca a comfortable victory. Earlier on the night Real Madrid went on top with a 4-1 victory against Real Betis. We needed to respond to that and boy, we indeed did that without much sweat. 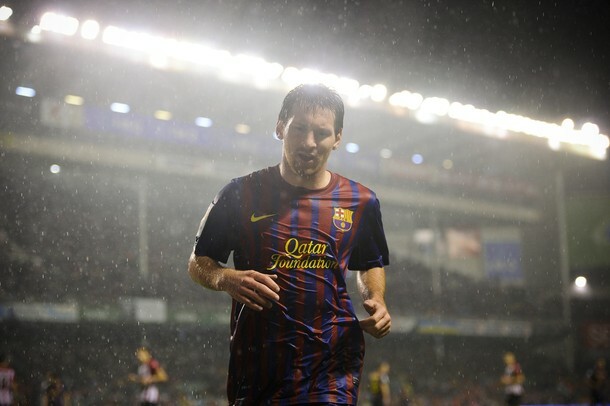 With his goals tonight Messi has become the second highest goal scorer in the history of Barca. There was an expectation that Guardiola will hesitate to start Iniesta from start, but we were proven wrong. Guardiola lined up with Victor Valdes, Alves, Pique, Puyol, Maxwell, Thiago, Xavi, Iniesta, Pedro, Villa and Messi. It was strange to see us playing with no holding midfielder, which meant if Racing put enough pressure in midfield we could have trouble. The cartoon featured today on Sport.es right expresses the anxiety we Barca fans have about International breaks. It's not like we lost so much after International breaks, but there is no denial that a number of our lackluster performance came following the break. But this time around we shouldn't have such thoughts crossing our mind as the cartoon say "We got Andres Iniesta - The Anti FIFA Virus Guys". Iniesta has been declared fit last week and has been training with the B-Team. So he should be raring to go from the start. But Guardiola would only want to ease him slowly back into action. So he should get some playing time but not from the start. Meanwhile he could be pondering to rest Messi also especially after the South American players came only on Thursday. But the problem will be to telling that to Messi. Messi had a kind of confusing international outing - first he scored a goal after two years in Argentina colours in the victory against Chile. But then it went the other way when they lost to Venezuela in days. So he will be roaring to put that defeat past him. So will be Alves, who got himself sent of in 2-1 victory against Mexico. FC Barcelona made to the top of La Liga with a hard fought 1-0 win against Sporting Gijon. This incidently was the first away victory of the Catalan side this season in the league. Right now we are tied with Levante, who beat Betis at the top of the table. Barcelona is on the top due to their goal difference which is a whooping 19 goals. With Fabregas joining the injury list Guardiola went with Thiago, Xavi and Busquets. The defense had Alves, Mascherano, Abidal and Adriano. The front trio was the usual Pedro, Villa and Messi. When the starting line-up was made available it looked like a normal 4-3-3 formation, but the moment game started we were playing a 3-4-3 formation with Alves, Abidal and Mascherano in defense and Adriano playing as a attacking winger upfront. Bate player, Filippe described this Barca team as made of outer space creatures and definitely Barcelona produced a display to honour that compliment. 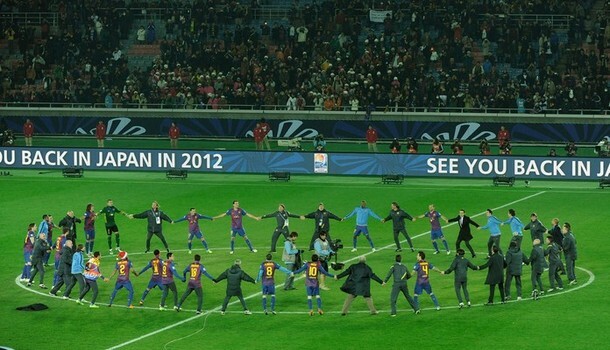 FC Barcelona won their first match of this year's Champions League season with a 5-0 result at the Dynamo stadium. This is our first away victory in all official matches till now. Two Goals from Messi, one each from Pedro and villa, and an own goal gave Barca an easy victory in Belarus. Those goals from Messi take him to the second top scorer for Barca in UEFA Champions League. Usually any match will have excitement about what line-up is going to feature. But with Guardiola this season that initial excitement has shifted about the formation that's going to line up. Having chosen 3-4-3 for majority of the matches this season, Guardiola decided to use the trusted 4-3-3 in the Dynamo stadium. We had Valdes in Goal; Puyol, Abidal, Mascherano and Alves in defense. Keita, Xavi and Thiago formed the midfield three. Pedro, Messi and Villas formed the attacking trio. FC Barcelona continued their excellent home run in 2011-12 La Liga season with a 5-0 victory against the high flying Atletico Madrid. 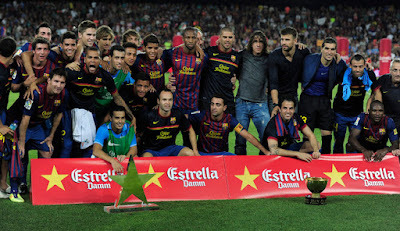 With this victory FC Barcelona moved to second place in the La Liga standing. David Villa opened the scoring for Barca, followed by an own goal from Miranda and three brilliant goals from Messi gave Barca a comfortable victory, which is Barca's fifth in a row against the same side. As I wrote in the preview, Guardiola went with a three man defense. But how the defense will line up was still a doubt with the line up on present. 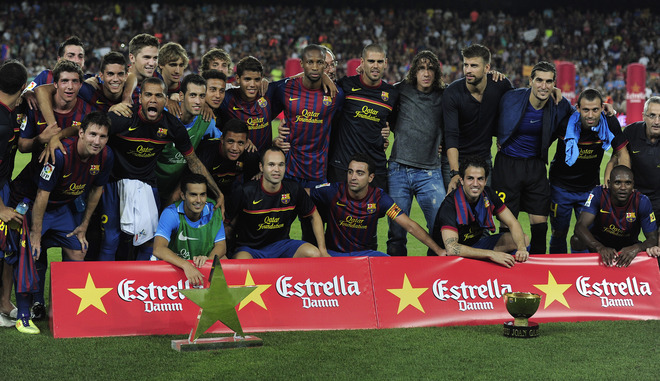 The line up picked by Guardiola was Valdes, Abidal, Mascherano, Alves, Busquets, Thiago, Xavi, Cesc, Pedro, Messi and Villa. Meanwhile Atletico Madrid had an exciting line up with Courtois, Perea, Miranda, Godin, Antonio, Gabi, Tiago, Mario, Diego, Reyes and Falcao. Every Barca fan will be approaching this game in most probability with a very much confused head. The confusion comes from the kind of oscillating results we had since the start of the season. Already there have been two away matches and same number of home matches. FC Barcelona has amazed a mind blowing 13 goals in the home matches. Even though there was no death of goals in the away fixtures, the problem was were were sharing those with the home team - being a nice guest, i would say. That's why following a 2-2 draw at Mestalla, we all will be a little trouble for what to expect from this game. No doubt that this one is going to be an entertaining one. Atletico has been firing in all cylinders in last couple of matches, especially with new signing Falcao on fire. And that's where Barca's greatest threat is to come tomorrow night. Atletico Madrid has scored two 4-0 victory at home in the last two matches, but it could be a complete different story at Cam Nou. Their only away match ended with a 1-0 victory in favour of the home side in Mestalla. Ibrahim Afellay, who recently returned from an injury suffered a huge set back with him suffering another serious injury. The official Barcelona site says - "Ibrahim Affellay has torn a crucial ligament in his left knee while training. He will require surgery and may miss upto six months of top flight football. That's would really hard for a player who expected this season to be a break out season. This is turning out to be a pretty bad month for Barca in terms of injury. First it was Sanchez, then Iniesta got injured and now it's Afellay. Wishing him a speedy recovery. FC Barcelona shaken off their recent poor result with an absolute 8-0 mauling of Osasuna at Camp Nou. After the two rather unfortunate draws, somebody had to pay and unfortunately Osasuna was on the fire line. And they did pretty bad. Messi scored three goal, Villa two goal, Cesc and Xavi scored one each and also there was an unfortunate own goal from Roversio.Have to admit everyone looked a bit nervous approaching the start. Two consecutive draws made this encounter a must win encounter for us. 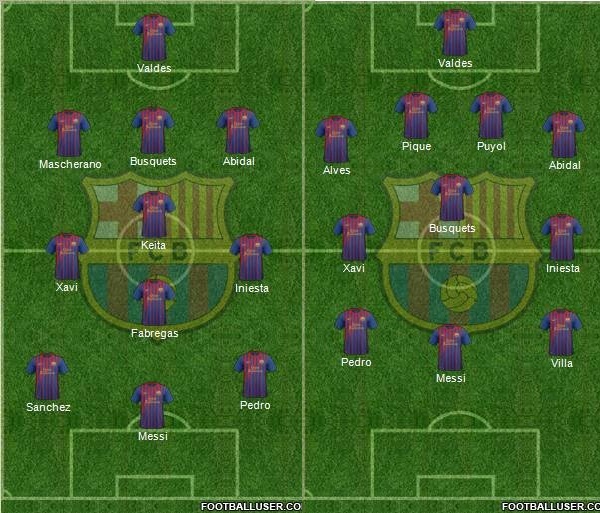 Guardiola went in with the strongest available defense lining up Alves, Puyol, Mascherano and Abidal. 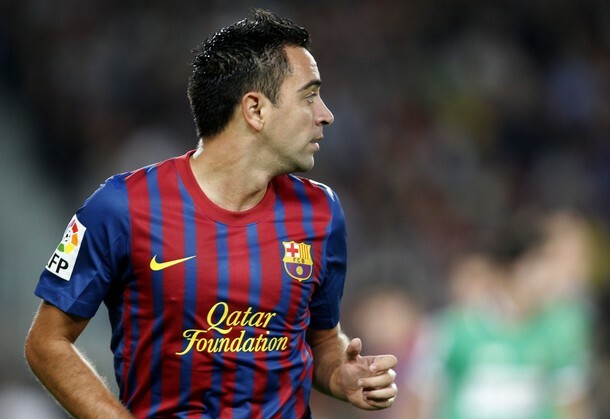 The midfield had Busquets back in the holding midfielder role with Xavi and Fabregas to keep him company. 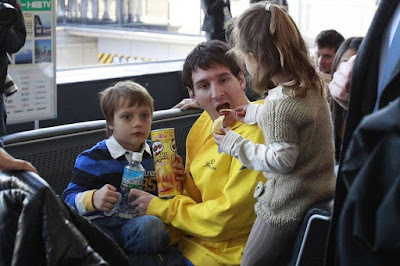 Thiago, Messi and Villa made up the attacking trio. FC Barcelona for the second time in four days failed to kill off a game which they dominated, and ended sharing points in the first match of Champions League this season. AC Milan took a shock lead within 25 second of start through Pato. Barca over turned it from through goals from Pedro and Villa, but then in the dying moments Thiago Silva equalised from the corner for AC Milan. Despite the last week's stumble. 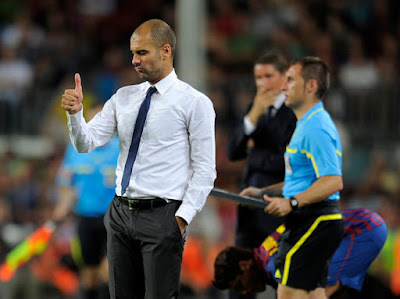 Guardiola went in again Keita as the holding midfielder but this time having Xavi and Iniesta to keep company. The defense had Albves, Mascherano, Busquets and Abidal. The front trio was reinstated to the usual MVP - Messi, Villa and Pedro. It is becoming very clear that Guardiola is going to continue with this experiment of Keita as holding midfielder throughout this season. Milan lined up with Pato, Cassano, Boateng, Noecerino, Seedorf, van Bommel, Abate, Nesta, Thiago Silva, Zambrotta and Abbiati. Visiting Anoeta stadium is becoming a head-ache for Guardiola. Last season we ended losing well after we secured the title, this season it was an improvement with a 2-2 draw. By doing this Guardiola has continued the glorified tradition of dropping point of the second league match, last time we lost to Hercules. As Sid Lowe of Guardian said, draws in this League are the new defeat and in the end this result could have some impact how the league ends. Followers of Barca will argue that it's a familiar sight after an international break but this time it all has to come down to complacency. Guardiola started with Fontas and Busquets in centre of defense flanked by Adriano and Alves on both side. The midfield had Cesc, Keita and Xavi. Pedro, Thiago and Sanchez formed the front three. Messi, Abidal, Villa, Puyol, Pinto, Mascherano, Villa and Iniesta found place only on the bench. Once again it showed clearly that playing Keita as the holding midfielder could take us out of some important competition and it's a ridiculous exercise. For some time Sevilla President, Jose del Nido has been the fiercest critique of the La Liga TV deal which results in the big two, FC Barcelona and Real Madrid taking home 50% of the share. He has uped the ante by recently calling upon other Club Presidents to go for a French revolution style revolt and force the big two accept an equal sharing deal. Everyone knows that it's not going to happen but still his points deserved to be discussed as it will surely help in La Liga surviving as whole. In a broad statement showing the big two's unwillingness to take a cut in TV money, the former Real Madrid Sporting Director Jorge Valdano warned that Barca and Madrid may split off La Liga for an European League. The supporters of the two big clus hate such a deal as they know that will curtail their resource in acquiring the best talents available. The detractors of the deal always point out at the enormous gulf between the big two and the rest. The recent set of cries comes out after Barca's 5-0 victory against Villareal.